The Publications Listing widget allows users to list publications authored by individuals who have Oxford Single Sign-On (SSO) IDs and publications listed in Symplectic Elements, the University's central database that records bibliographic and other information about research outputs. The options on the Publications screen allow Site Administrators to configure which publications metadata sources are used to populate the results the listing widget provides. In Symplectic Elements users can set a 'preferred record' for each of their publications. This refers to the records held by citation databases, such as PubMed, CrossRef, etc., which display metadata for each publication. A user might prefer one database's record over others because of factors such as the completeness of the metadata (e.g. one record source might provide complete abstracts, whereas others do not) or the formatting of metadata (e.g. one source might provide author and title information in a more user-friendly presentation). If the 'Prioritise preferred source setting made in Symplectic?' checkbox (1) is checked, the Publications Listing widget will display publication information in the format set by the source set as the preferred source in Symplectic. If the 'Prioritise preferred source setting made in Symplectic?' checkbox (1) is not checked, the Publications Listing widget will display publication information in the format set by the sources set in the 'Preferred publication sources' selection area (2) on the Publications screen. If the users listed (by their SSO IDs) in the Publications Listing widget(s) actively manage their publications in Symplectic Elements, it is likely the settings in Symplectic will be preferred. In this case, checking the checkbox (1) should result in publications being presented as desired by users. 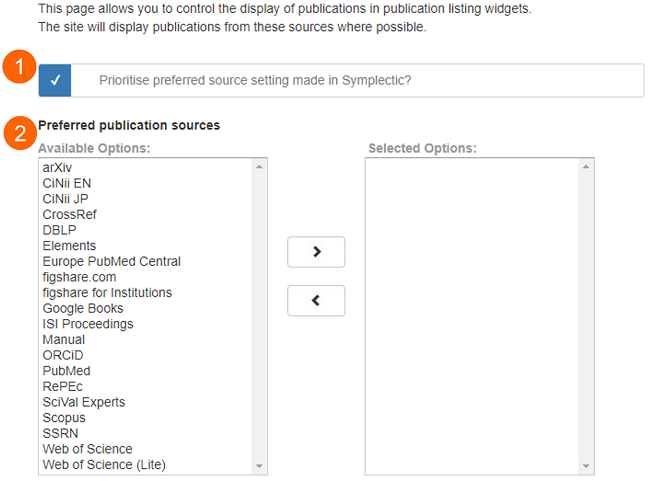 However, if there is a lot of variation in the settings of users' preferred sources in Symplectic, the 'Preferred publication sources' selection area (2) can be used to select a default list of sources for the Publications Listing widget, which will help to provide greater consistency across the publications listings on the site. When listing the 'Preferred publication sources', the Publications Listing widget will prioritise records from sources at the top of the list, and defer to the sources listed beneath if no record exists in the above-listed source. To implement a listing of publications on a page, the Publications Listing widget needs to be used on a page.